Headlines, hot news, and conversation starters on February 7, 2018! 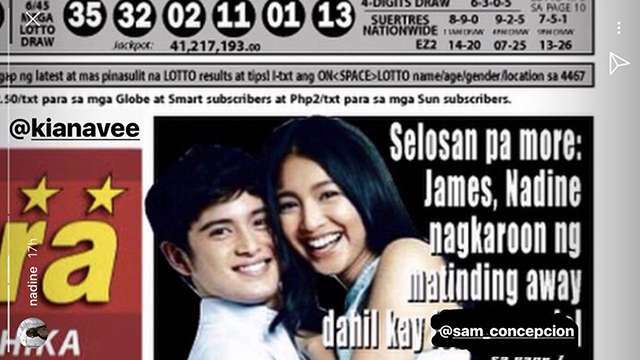 Nadine Lustre and James Reid have been subject to yet another rumor about their relationship. 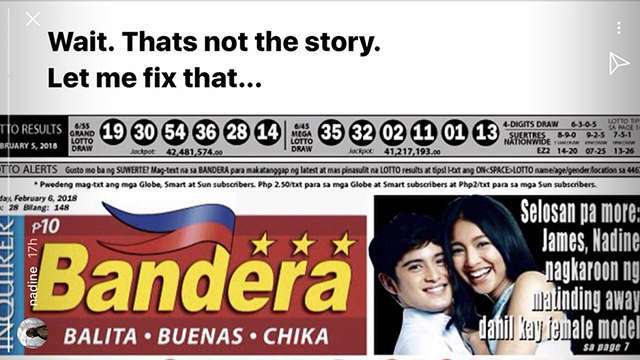 Tabloid newspaper Bandera released a story with the headline Selosan Pa More: James, Nadine Nagkaroon Ng Matinding Away Dahil Kay Female Model. 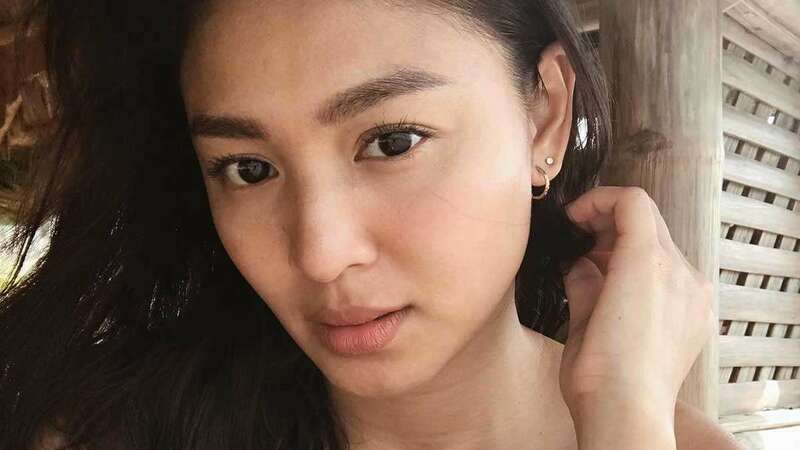 Nadine posted a shot of the article on her Instagram Stories, saying, "Wait. That's not the story. Let me fix that." On her next IG Story, she covered the word "model" and tagged James' BFF Sam Concepcion instead. LOL! 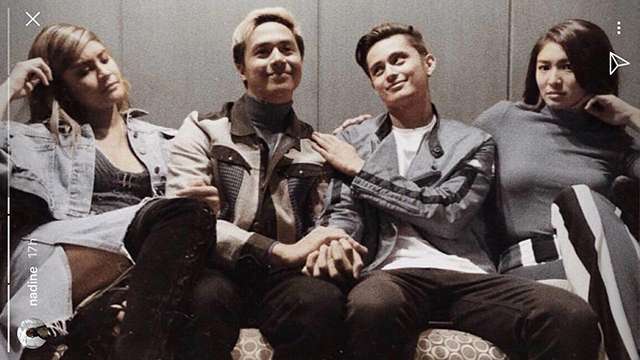 She then posted a recent photo of her being all selos of James and Sam's bromance, along with Sam's girlfriend Kiana Valenciano. Hey, if life gives you lemons, make it a sassy AF Insta Story! Angelica Panganiban was spotted at the premiere of her ex-boyfriend Carlo Aquino's new movie Meet Me In St. Gallen. Here she is smiling for the cameras with her actor-comedian Ketchup Eusebio. Here's your first look at the new teaser of Solo: A Star Wars Story. The new film features Alden Ehrenreich as Han Solo, with Woody Harrelson, Donald Glover, Emilia Clarke, and Thandie Newton. Solo: A Star Wars Story opens in Philippine cinemas on May 25. 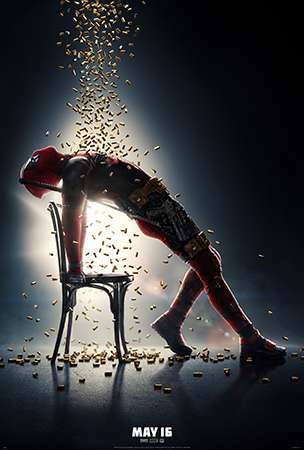 Deadpool is making a huge comeback to the silver screen with Deadpool 2! Mark your calendars for May 16 when it opens in Philippine cinemas.